STEVENSON is pleased to present a solo exhibition by Wim Botha, his eighth show with the gallery since 2003. The exhibition follows Still Life with Water, an installation at Fondation Blachère in Apt, France, earlier this year. Here, Botha departs from the buoyancy and ethereality of water and sky to descend into the somatic. Intimations of corporeality appeared in his 2015 exhibition in Johannesburg that focused on Michelangelo's first Pietà. Yet, where the latter reflected something of the ordered elegance of the High Renaissance, the new work invokes equally the carnal impulses and recesses that predate knowledge, language and civility. The pristine blue and white light of previous exhibitions is heated into a cloying pink hue. Pigments are created from the residue of shaved stone. Crystals are grown on busts to lend them energy and ecstasy. The recurring combination of red wax, white marble and unvarnished wood recalls flesh, bone and sinew. In a shift of proportions, Botha’s usually large-scale works are concentrated into palm-sized objects in order to supplant confrontation with contemplation. The busts inspire relation as much as they do reverence. 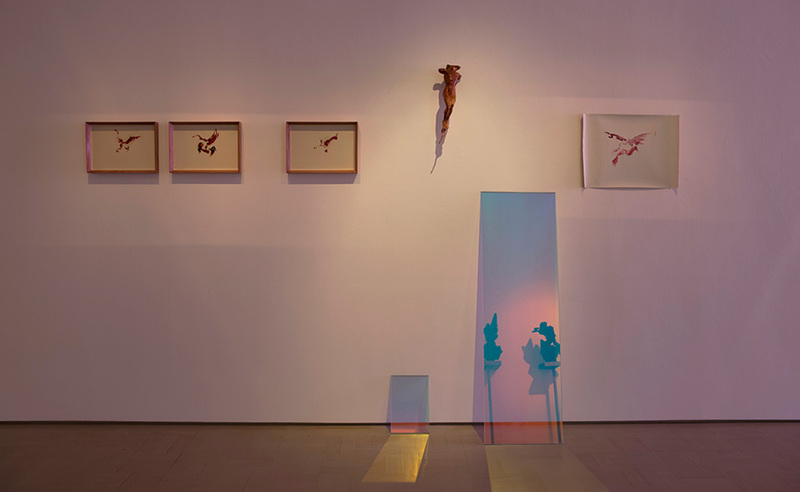 At the heart of this exhibition is an installation titled The Universal Truths Escape Me, a fragmented Leda and the Swan made up of wings and body parts set amid a landscape of glass. The wings recall those carved from white polystyrene in Solipsis V; however, cast in raw, red wax, the grace of their flight is undercut by the brutality of their musculature. Botha has received a number of prestigious awards, including the Helgaard Steyn Prize for sculpture in 2013, the Standard Bank Young Artist Award in 2005, and the first Tollman Award in 2003. The exhibition opens on Thursday 13 October 2016, 6-8pm. A discussion of the works by the artist will take place on Thursday 17 November 2016, 5 for 5.30pm. The exhibition has been extended until 3 December.